In high school art class, my daughter Rachel painted a dark picture of evil. It depicted a man enveloped with clouds of debris and ashes leaving a city of destruction. It was reminiscent of the 911 attack on the twin towers in New York City. Several years later, I was going through the agony of the end of a 30 year marriage. All of my four kids had moved out and I was living in a small house by myself. I borrowed the painting from Rachel, hung it on the wall, and applied stenciled letters underneath with the hopeful words, “God is our refuge and strength, a very present help in trouble.” One morning while I was crying out to God, during my devotional time, I physically sensed Jesus wrapping his comforting arms around me. In those dark days of my life, Jesus (Immanuel) was with me. Jesus continued to fill me with hope as he wrapped his physical arms around me with loving support from family and my brothers and sisters in Christ. For many people, the Christmas season is a time that brings back agonizing memories. It may be the death of a loved one, the loss of a relationship, loss of a job, or degenerative health issues. Things are not as they should be. There is pain and suffering. 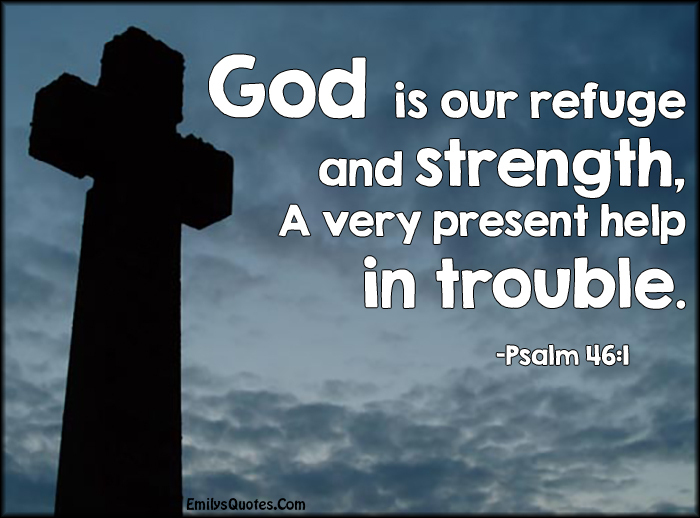 The Good News is that God is your refuge and strength. God comes to you as a humble baby in a manger and his name is Jesus Christ, the Savior of the world. Thank you, God, for giving us Jesus who is the light that shines in our dark places. Strengthen us by the power of the Holy Spirit to bring the light of Jesus to our neighbor in need. Amen. Where do you see the light of Jesus shining in the world? How do you see Jesus using you to wrap your loving arms around someone in need?